Come tour our Model! Open on Tuesday, Thursday, and Saturday from 11AM-2PM or by appointment! 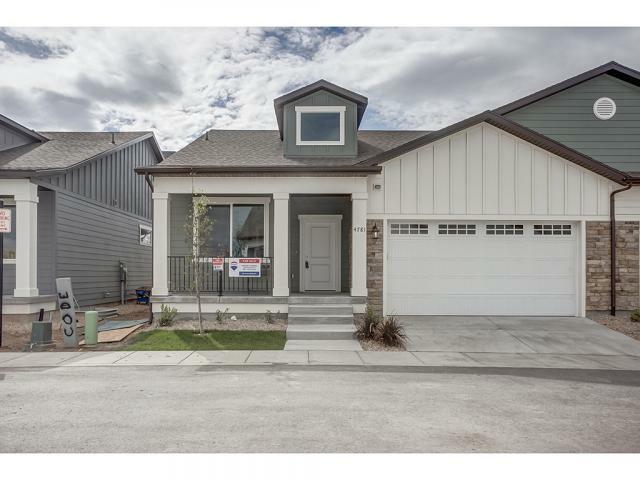 Located in the heart of South Jordan adjacent to the 18th hole of the Glenmoor Golf Course. This 55+ Adult Community is designed to offer you maintenance free yards & main floor living space. Amenities such as outdoor pool & hot-tub, clubhouse, pavilions & outdoor BBQ areas offer you a great experience for the entire family. Inside this beautiful home you will find an open, spacious floor plan with custom finishes throughout! Some of the features you'll love include an open kitchen with custom cabinets, stainless appliances and an island. A master suite with an ensuite bath offering double sinks, a separate tub and shower and walk-in closet. This home also has two tone paint throughout, plenty of windows for natural lighting, and beautiful laminate, tile and carpet flooring. Come see our model and reserve your lot before we sell out! *PHOTOS ARE NOT OF ACTUAL HOME, BUT OF PREVIOUS MODEL HOME. 2 months to completion...pick your colors!